One lucky person had the encounter of a lifetime when they encountered the enormous animal. 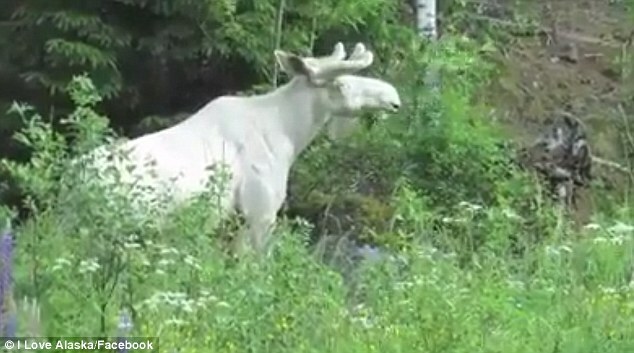 In the video clip, the Albino moose is seen munching away at some leaves while the person filming stands just feet away. With a population of only 736,000 and a land mass of 663,000 square miles, it's exceedingly rare for a human to every cross paths with a white moose. Another rarity of the siting is that the moose still has on its velvet - the vascular skin on the antlers that is eventually shed. The velvet makes the moose's antlers appear snowy white, just like the rest of its body. 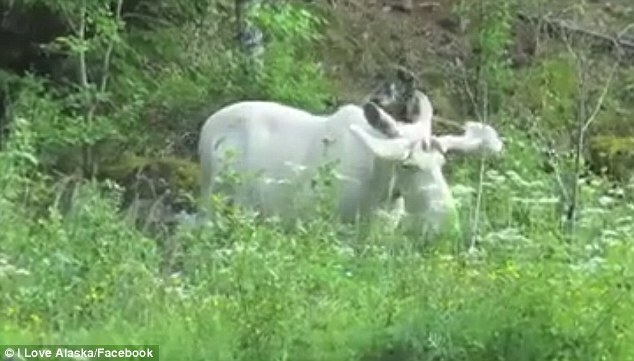 The white moose happily grazes unfazed by the camera rolling near it. Some experts have explained that white moose are an incredibly rare genetic mutation, but don't match the typical definition of Albinism. However, the term Albino and white have been used interchangeably in reference to the moose. White moose have been spotted in Manitoba, Saskatchewan, British Columbia, Newfoundland, Alaska and Idaho and are still incredibly rare. Murray Brilliant, the director of the Center for Human Genetics at the University of Wisconsin and an expert on albinism, says Albinism can occur in any specie and if the right pattern of breeding occurs it can become a dominant gene, according to Canadian Geographic. Responses to "Majestic Albino Moose Is Spotted Grazing For Leaves "